We’d love your help. 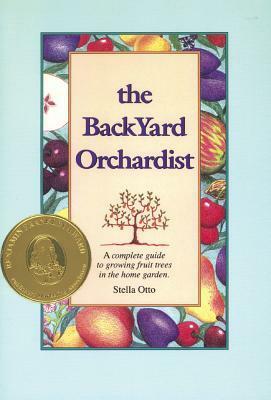 Let us know what’s wrong with this preview of Backyard Orchardist by Stella Otto. For every gardener desiring to add apples, pears, cherries, and other tree fruit to their landscape here are hints and solid information from a professional horticulturist and experienced fruit grower. The Backyard Orchardist includes help on selecting the best fruit trees and information about each stage of growth and development, along with tips on harvest and storage of For every gardener desiring to add apples, pears, cherries, and other tree fruit to their landscape here are hints and solid information from a professional horticulturist and experienced fruit grower. The Backyard Orchardist includes help on selecting the best fruit trees and information about each stage of growth and development, along with tips on harvest and storage of the fruit. Those with limited space will learn about growing dwarf fruit trees in containers. To ask other readers questions about Backyard Orchardist, please sign up. When you buy your first fruit tree, do yourself and your new tree a favor and buy this book too. Now that I have three planted in my backyard, I'm wishing I would have read this prior to planting; I would have dug a much bigger hole and amended my clay soil with more sandy-loam and compost. I also would have done a better job setting my trees up for production by properly pruning those first few years of growth. Today is a new day. This is an easy-to-read book that covers all major fruit bearing When you buy your first fruit tree, do yourself and your new tree a favor and buy this book too. Now that I have three planted in my backyard, I'm wishing I would have read this prior to planting; I would have dug a much bigger hole and amended my clay soil with more sandy-loam and compost. I also would have done a better job setting my trees up for production by properly pruning those first few years of growth. Today is a new day. This is an easy-to-read book that covers all major fruit bearing trees with specific information for trees in different zones. Now I know, when and how to prune properly. What pests to watch out for and how to prevent infections/infestations and treat them in the most effective manner. I.e. most pests have a predictable time when they are going through some sort of molt or metamorphosis making treatment particularly effective. It is best to treat a specific problem and avoid “all-purpose” treatments as they are toxic to your backyard ecosystem and may create problems that didn't exist prior by killing of natural pest predators. Basic primer. A good book if you are just starting to learn but not comprehensive. Got this book from the library to look into how to grow apple trees, and it seems like a really comprehensive guide to locating, planting, pruning, and caring for fruit trees at all stages. It even includes a list of common insects, fungi, and bacteria, their signs on your trees, and how to combat them in organic and non-organic methods. Unless I find another amazing book, I'll probably buy my own copy of this one. I think this will be a great reference book to have in my library especially as our little orchard grows. The first half of the book was about why to plant a fruit tree and how to prepare to plant a fruit tree which was very informative however since my orchard is 2 years old I was hoping for more about caring for the orchard and less about preparing to plant one. Good information for anyone with fruit trees. This seems like a very good resource and it was well worth reading. My only hesitation is that it seems a bit old. I am one that values time tested solutions but as new varieties come out among other things resources can become outdated. I am going to check on some of these things elsewhere with newer resources but I am sure that I learned a good bit from this book all the same. Lot's of great info on planting "compact orchards" or the most possible fruit in the smallest spaces imaginable!! Great little book and extremely well written for this 'type' of book. this book is full of good straightforward information. I do think she could go into a little more detail at times, but it's a good start for learning about fruit trees. This was very helpful as I was planning my little home orchard. More for a novice. Needs more solutions for problems. Ask me in three years if I have fruit trees. That answer will be my rating of this book. This book was excellent in it's depth and detail. I consider myself an "advanced novice" gardner. I learned a ton and refer to it regularly. I know have 8 thriving fruit trees. Good basic information. Would have preferred more emphasis on organic methods of growth and pest control.